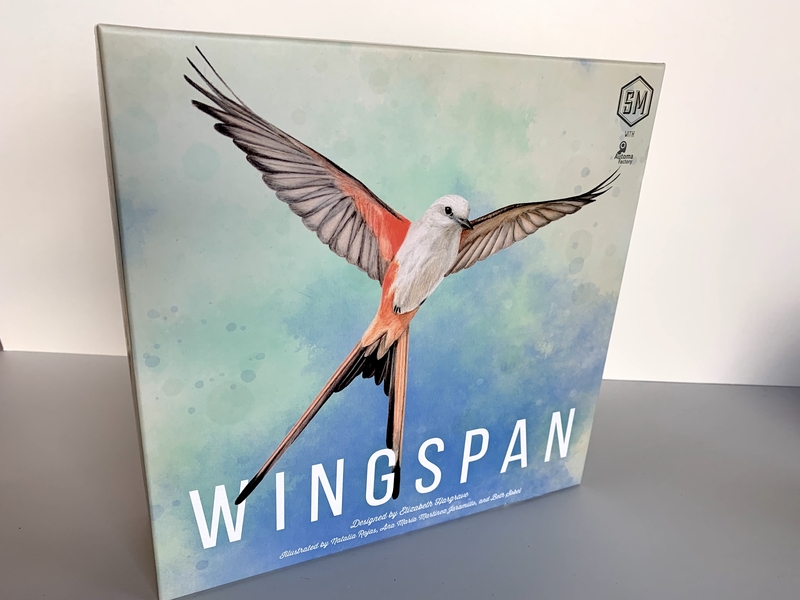 Call me odd, but the above description was enough to get my heart racing and my brain spinning up a premature take about how Wingspan will be the best board game of 2019. I wasn’t alone in my excitement. Officially released last weekend, the game has been racking up some piping hot early buzz, so much so that publisher Stonemaier Games undershot demand for the title’s initial print run and is now playing catch-up. eBay scalpers are cashing in on the short-term FOMO, with copies going for as high as $200 over its retail price (one slightly suspicious listing went for $690). Even The New York Times published a piece about the game and its first-time designer, Elizabeth Hargrave. It’s easy to see why. For starters, the game is absolutely gorgeous. In Wingspan, players are bird enthusiasts trying to attract birds to their aviaries. There are 170 unique bird cards in the game. The birdhouse dice tower is adorable. When you pick a die from the birdfeeder, you take a corresponding food token. These are not chocolate eggs, no matter how much you may want them to be. The game comes with these handy plastic trays for storage both in and out of play. Cards are stored in this included box, which reminds me of a baby wipes container. Its lid serves as a card display during play. Player colors are often boring. Not here! Objective cards give you end-game goals to shoot for. Variable end-of-round bonuses keep you on your toes throughout the game. Here’s all you need to play a quick solo game. Looks can be deceiving, though, and hype is a fickle beast. How does the game actually play? Wingspan puts you and your friends in the role of bird enthusiasts trying to attract birds to your individual aviaries. Birds are represented by cards, which slot into one of three rows on your personal player board; the rows represent the three different habitats in your preserve—forest, grassland, and wetland. But the habitats also cleverly double as action spaces. Enlarge / You play bird cards into one of three habitats, each corresponding to a specific action. The more cards you’ve played in a row, the more powerful that action becomes. Over the game’s swift four rounds, players take one action per turn; actions are tracked by placing little cubes on one of the four areas on your personal player board (the three habitats plus an extra space). The forest action lets you scavenge for food resources—which is to say, grab some dice from the dice tower and convert them into the appropriate food tokens. 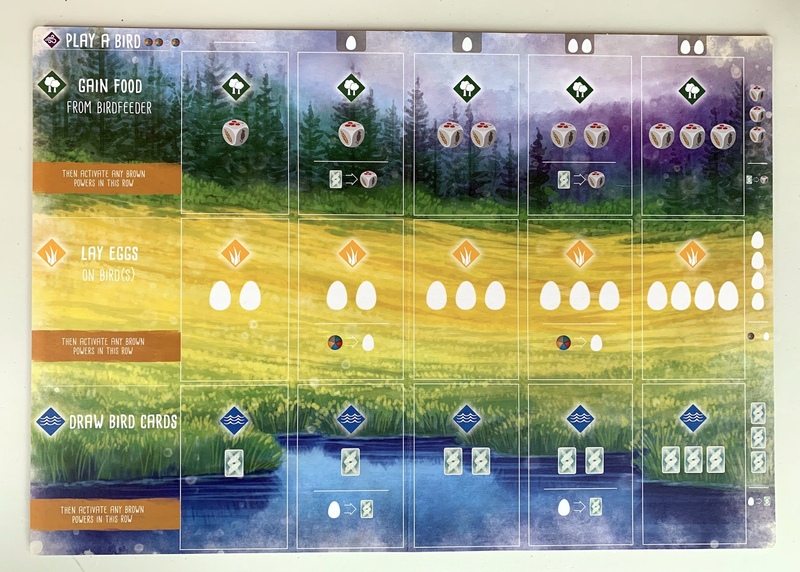 The grassland action lets you lay eggs in the nests of birds already on your board. The wetlands action lets you draw more bird cards. And an additional space allows you to play the bird cards themselves. The game is remarkably simple—you’re only ever choosing between four actions. The fun is in how the cards you’ve already played on your board make the actions more powerful. To play a bird card, you must put it in the correct habitat and pay its food requirements. Some birds will only nest in one of the habitats, others are more flexible, and a few even flit from habitat to habitat throughout play. Bird cards come in four main varieties, each providing a different sort of effect. There are one-time “when played” effects, triggered effects that key off other players’ actions, big-point-scorers with no special abilities, and “engine” cards (the bulk of the deck) that give you special effects every time you take that row’s base action. When you place a cube to take an action, you put it on the right-most uncovered space in that action’s row and take the rewards. You then move your cube leftward across the row, triggering every special ability you pass along the way. “Engine building” is a staple mechanic in Euro-style board games—essentially, you start with nothing, but as you build up a collection of different pieces (cards, in this case), your “machine” starts to churn out stuff for free. So while my first “draw bird card” action of the game might be simply “draw one card,” once my wetlands fill with birds, that action will be much more powerful. In the above example, I’d get upwards of eight cards and four points for that same action. Now that’s value! With so many good things going for it, I was surprised that I felt a bit let down by my first play of Wingspan. Because of its “medium-weight” designation, I was expecting a little more crunch in the decision-making, a little more complexity in running my three engines. My favorite part of engine-building games is the sense of accomplishment you feel when you piece together a particularly clever point-generating machine, with parts that feed into each other and explode in combos that shower you with well-earned rewards. Wingspan has these elements, of course, but the game’s card-driven engine-building is not as complex as something like Terraforming Mars (a game Stonemaier mentions in its Wingspan trailer). While the stats on the bird cards differ, card effects are repeated across different cards; by my count, there are 39 unique abilities. This makes getting the cards you need more consistent, but it also limits the number of crazy card interactions in the game. Running your engines also feels pretty plug-and-play—slot in some cards and watch as they give you free stuff. You can specialize and dig out combos, but you can also just throw cards out there and watch your rewards roll in. None of this is a bad thing, of course. Early comparisons to other games skewed my expectations a bit, but when I recalibrated and played the game for what it is, I really fell in love with it. This is an approachable, “gateway-plus” game that provides an accessible entry point into engine-building games while offering fun decisions for seasoned gamers. Gaming vets will probably school newbies, but everyone can build something to take pride in. Like Viticulture, another Stonemaier game, Wingspan asks you to roll with the punches. There’s randomness in the dice and cards you can choose from, and the private “objective cards” that give you an end-game goal to shoot for may or may not align with your starting hand—or with any of your session’s end-of-round bonuses. The game gives you tools to mitigate some of this randomness—rev up your card-draw or resource-gathering engines to dig for what you need, for example—but players who want to decide on a strategy at the start of the game and stick to it inflexibly are likely to have a bad time. The key is to react quickly to what the game throws at you. Balance seems good overall, but the “lay eggs” action is quite powerful, particularly toward the end of the game. If you’re not laying eggs on your last couple turns, you better have a very good reason to be doing something else. I hesitate to call it “overpowered,” but it does seem powerful enough to potentially make the endgame a bit one-note. Player interaction is limited to competition over cards and resources, jostling for majority in end-of-round bonuses, and cards that trigger on other players’ turns. That’s plenty for a game of this type, and you probably know if your gaming group enjoys that style of play. Finally, Wingspan includes a nice little solo mode. The AI “automa” is not as robust as the one seen in Stonemaier’s Scythe or Viticulture, but it gets the job done and throws enough challenges at you to coax slightly different tactics out of you over multiple games. And it plays incredibly quickly. If you’re a birder or have any sort of affinity for our fine feathered friends, you need to own this game. Small details help sell the game as a “game about birds” as opposed to just “a game with a bird theme.” Each card lists both the common and scientific name of the species, along with a brief fact and a map of the areas it can be found in the wild. The card effects have cute thematic flourishes, like predators who let you draw a bird and “eat” it (tucking it under the predator for points) if the prey’s wingspan is small enough. Flocking birds have a similar tucking mechanic, while mockingbirds let you copy the power of another card. Vultures get to grab a food resource when someone else makes a predator kill on their turn. A full board simulates a bustling avian ecosystem. An expansion is already in the works, and we’re hoping it gives us a bunch of new abilities to experiment with. But Wingspan is already a fun game with a lovely theme, and it should find a happy home in many groups’ collections. Stonemaier Games is currently reprinting Wingspan; a preorder is available on the publisher’s website for an early April shipment.